In the midst of the uproar over revelations that Libyan nationals are buying and selling migrants in the country as slaves in Libya, new revelations indicate that Nigerians based in the country also abducted and sell their fellow Nigerians - men and women. This emerged as more Nigerians are repatriated by the International Organisation for Migration with the backing of the European Union in an ongoing exercise that has seen 1,295 retrieved from Libya in November alone. Since the beginning of 2017, IOM-facilitated repatriation has brought back 5,578 Nigerian migrants, who were trapped in and outside prisons across Libya. 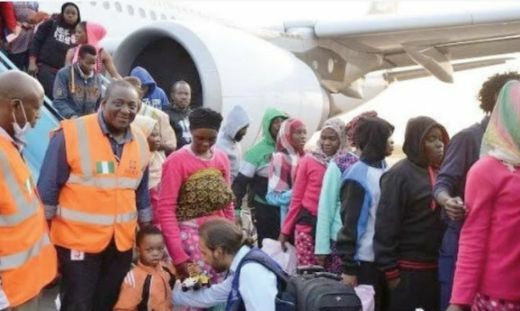 On Thursday night, 150 migrants from mostly Edo and Delta states arrived the country aboard a Buraq Airplane at the cargo terminal of the Murtala International Airport, Lagos. It was two days after 239 migrants had also been brought into the country. Many of the returnees, who were thankful for being back, confirmed to Punch that they were sold by their fellow countrymen, who were getting rich in Libya. One of them, 26-year-old Odion Saliu, a hairdresser from Edo State, said she was kidnapped and handed over to a Nigerian, who forced her to call her mother. According to her, her mother in Benin paid N200, 000 but she was again sold by the same Nigerian for 3,000 dinars (about N794, 000). Saliu explained that the Nigerians spoke Pidgin English and some Nigerian languages. She said, “When I was kidnapped with others and held for some weeks, the Arabs asked if I wanted to be taken to a Nigerian and I readily said yes. I was very happy that I was going to someone from my country. But it was a lie. “The Nigerian they took me to locked me in a cell and told me to call my mother and ask for N60, 000. The man said he would sell me to a connection house if my family did not get the money. I called to inform my mother and the trafficker who facilitated my journey from Nigeria. “But the trafficker spoke with them on the phone and told them the amount they demanded was too small. They increased it to N200, 000. My mother paid into an account after they provided her with the account number over the phone. Another Edo State indigene, Sunday Anyaegbunam, left Nigeria along with his wife in April. He said during their nine-day journey through the desert, they were sold twice by Nigerians. According to him, when their Nigerian “burger” (trafficker) sold them to another set of Libyan traffickers at Agadez, Niger, the traffickers sold him and his wife to a Nigerian who took them to Sabha, Libya, where they were separated in different cells. “We were made to contact our families on the phone and I had to ensure the payment of N400, 000 for my release and N300, 000 for my wife,” Anyaegbunam said. Like others, he could only identify the Nigerians trading in their countrymen in Libya through the Nigerian languages they spoke and their accent. He said, “The Nigerians selling people in Libya are more wicked than many of the Arabs. I have never seen people so heartless as the Nigerians who bought and sold me. “There are many of them in Agadez and Sabha, who are making so much money from selling their own people. But there are other West Africans doing the business too. A 25-year-old woman, Esosa Osas, who was in Libya for six months, said she also met many Nigerians selling their countrymen. All these accounts were corroborated by 35-year-old Harrison Okotie who lived in Libya for three years until his repatriation. “Nigerians and Libyans are doing the business like they are one big happy family,” he said. Most of the migrants who arrived Nigeria on Thursday were from Edo State. Officials of the state’s task force on illegal migration were on hand with luxurious buses to transport their people back home. A member of the task force, Okoduwa Solomon, told Punch that his team had made six such journeys to the airport within the last one month to take their indigenes repatriated from Libya back home. He said, “The first process is to take them through counselling, then we profile them. “After that, we put them in a home that the state government has provided for the returnees. The Edo State Government is paying each of the returnees from the state a stipend. Officials of the National Emergency Management Agency coordinate the reception of the returnees at the airport.South West Zonal Coordinator of the agency, Yakubu Sulaiman, said the returnees would be lodged in a hotel where they would have the chance to clean up before their journey back home. Meanwhile, President, Women Arise and Centre for Change, Dr. Joe Okei-Odumakin, has called on the Federal Government to use all diplomatic channels to prevail on the Libyan authorities to ensure the dignity of our people. She said in a statement on Friday that it was an embarrassment that Nigerians who were treated like royalty in the past were being dehumanised in a foreign land. “We must build a country where our people have opportunities to prosper and lead useful and productive lives and will only travel on leisure and business and not as illegal migrants desperate to live anywhere other than Nigeria,” she said. Meanwhile, Head, African Union Commission, Moussa Faki Mahamat, has said that over 400,000 Nigerians and others remain stranded in Libya. Hundreds of thousands more — “400,000 to 700, 000,” according to Mahamat — remain stranded. European and African leaders have set themselves a tall order to stamp out horrific abuse of African migrants, some of them are Nigerians in Libya, where thousands are suffering in a vast, lawless territory. On Thursday, a summit of the African Union and the European Union set a goal of immediately repatriating 3,800 migrants languishing in a camp near Tripoli. But experts pointed to a daunting array of hurdles, from extracting migrants in perilous situations to giving them incentives to stay put when they return home. Even so, the summit’s commitment, initiated by outrage over a CNN report on black Africans being sold as slaves in Libya, is being welcomed. “It is a step in the right direction,” International Organisation for Migration Europe Director, Eugenio Ambrosi, told Agence France Presse by phone from Brussels. “It is a little bit too much to think it will solve the slavery issue, but it would definitely mitigate (it) to some extent,” Ambrosi said. The drive was announced at a meeting on the summit sidelines organised by French President, Emmanuel Macron. It brought together eight other EU and African countries as well as the AU, EU and United Nations representatives. Macron said the UN-backed Libyan government of Prime Minister Fayez al-Sarraj had identified and granted access to the worst camps to enable the returns of people who want to go home. The Macron group also decided to work with a task force, involving the sharing of police and intelligence services, to “dismantle the networks and their financing and detain traffickers,” he said. They pledged to freeze the assets of identified traffickers. The AU is expected to set up an investigative panel and the UN could take cases before the International Court of Justice. Governor Godwin Obaseki of Edo State has approved a seed capital of N100m and 150 hectares of land for 150 victims of human trafficking, who recently completed skills acquisition training in the state. Obaseki announced this on Friday during the graduation of the participants of the programme, which was organised by the Edo Agricultural Development Programme in Benin City, the state capital. He also directed the Ministry of Agriculture and Natural Resources to immediately liaise with the relevant authorities towards securing the land for the returnees to commence their agricultural businesses. According to the governor, the beneficiaries would be put under the supervision of the Benin-Owena River Basin Authority and the EADP. Obaseki stressed the need for coordinated efforts to end modern slavery. He stated that the International Day for the Abolition of Slavery, marked on December 2 annually by the United Nations, should be seen as a day for deep reflection on how to bring the illicit trade to an end. Obaseki said, “We ordinarily should not be talking about the menace of slavery given the experience we have had. But it is a reality today and we have no choice but to tackle it."